Mini-Vane Thermo-Anemometer measures air velocity, volume flow, temperature, relative humidity, and pressure, depending on model. Ideal for measurements at air outlets. Vane Thermo-Anemometer is ideal for balancing air conditioning and heating ducts or checking the operations of fans and blowers. Features a detachable probe for easy replacement. 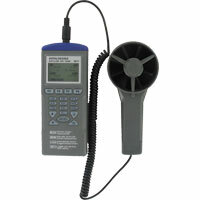 Integral Vane Thermo-Anemometer measures air velocity and temperature. Allows users to easily view readings. Includes hard carrying case, battery, and instruction manual. 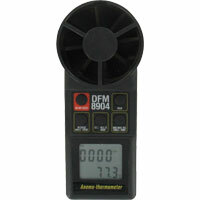 Compact meter is ideal for HVAC inspection, energy audits, and balancing applications. 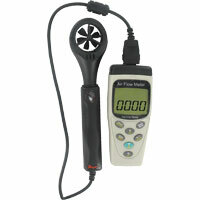 Vane Thermo-Anemometer measures air velocity, air volume, temperature, humidity, and BTU. Built-in sensor records ambient temperature. Features a detachable probe for easy replacement. 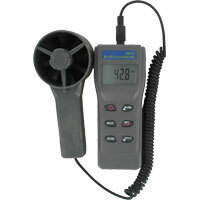 Multifunction Vane Thermo-Anemometer measures air velocity, air volume, temperature, humidity, and BTU. Includes an RS-232 interface setting. Miniature Vane Thermo-Anemometer measures air velocity, air volume, temperature, and humidity inside air ducts. Application in HVAC. Using MVA-02 to measure fume hood vent flow. Units are set to ft/min. Area set for 6 sq. ft. Readings are incrementing by 20 units at a time, e.g. 39 to 59 to 78 to 98... Specifications indicate resolution in 1. Is this normal? 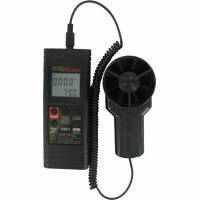 Readings that are incrementing by 20 units or so at a time, when using the MVA-02 (Mini-Vane Thermo-Anemometer), occurs when the air flow source is unstable. This is considered normal.